The vast majority of high-growth startup companies rely on some form of outside financings such as funding from angel funds, traditional venture capital, high net worth investors, or friends and family. While identifying a viable market and making a great pitch are crucial to raising investment funding, there is a seemingly endless array of other considerations that need to be addressed before those funds show up in your bank account and you are off and running to create the next big thing. In this article, I am going to look at one of those major decisions that most entrepreneurs and companies must face when they are raising investment funds and that is the pros and cons of using convertible notes to finance your company. Convertible notes have become increasingly popular in the world of startup financing, particularly in seed stage companies. However, before going down this path, it is important to understand the potential pitfalls of this type of financing and whether or not it is the best choice for your company. I will first give a brief overview of the basic concept of a convertible note and how it has some attributes of both debt and equity, and then I will look at the pros and cons of this form of financing. While everyone knows that an investor gives money to a company with the goal of getting more back in the end, there are many different ways this takes shape in practice. When most people think of an investment, they are thinking about equity. In an equity investment, a company sells a percentage of their company (equity) for a sum of money. When a company raises funding by selling equity, there is no set schedule for the investor to get repaid, and the investor generally counts on making their money back, plus a return, in a future liquidity event (such as an acquisition of IPO) or through distributions of future profits. In a typical venture capital investment, an acquisition or IPO is almost always the way that investors make their money, with distributions of cash flow being a rarity. Another key point about equity investments is that because the investor is a part owner of the company, they typically have some sort of voting rights that govern various decisions of the company. Most equity investments in venture capital-backed companies are structured as preferred stock, which is different than simply $X for Y% of the company. When the investment is structured as preferred stock, this typically comes with terms such as a liquidation preference, a preferred dividend, and approval rights over certain company decisions. In most types of preferred stock, the liquidation preference means that in a liquidity event, the investors get the value of their investment back, plus any preferred dividends, prior to the rest of the funds being distributed amongst the % ownership. The preferred dividends are generally not paid in cash, but accrued and paid out when there is a liquidity event. As common stock is generally owned by founders and employees of the company, this means that all the investors must be paid back plus a guaranteed return (the preferred dividends) prior to any funds being distributed to the common stock. In addition to regular voting rights, the preferred stockholders also often have additional approval rights over items such as the terms of subsequent rounds of financing and acquisition opportunities. Receives share of proceeds on a percentage ownership basis, after debt is satisfied and preferred stock receives its return of capital plus dividends. After debt is satisfied, receives return of capital plus dividends, and shares in remaining proceeds on a percentage ownership basis. The most typical type of debt is a loan with a set schedule for repayment of principal and interest. Assuming the company can make the payments, the investor knows what return they are getting in advance. 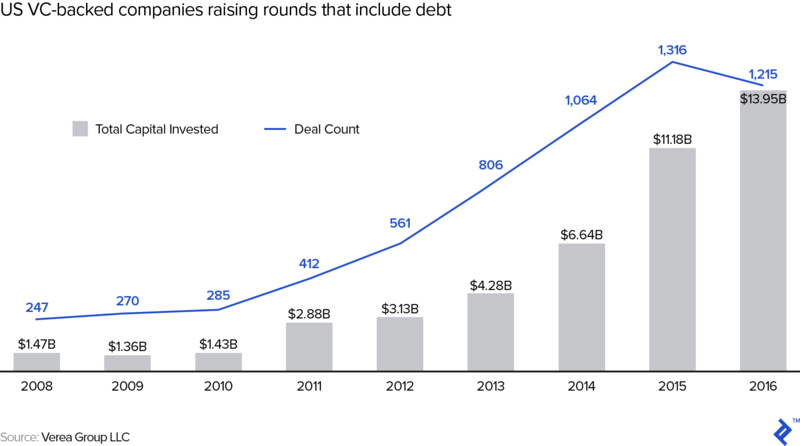 Given the uncertainty of early-stage startups, debt is not very typical when it comes to funding this type of risky venture. However, there are some institutional investors that provide debt to later-stage venture-backed companies, particularly those with recurring subscription payments such as SaaS companies. There are a few notable facts when it comes to debt. In contrast to equity owners, debt holders do not have an ownership interest in the company and do not have voting rights. However, when it comes to the priority of payments in a liquidation scenario, debt holders are paid in full before equity holders, so it is perceived as a less risky investment. When it comes to the complexity of documentation and legal work that goes into setting up various investments, it is simpler and less expensive (at least in reference to a typical startup funding deal) to structure a debt deal in comparison to equity. In short, convertible notes are originally structured as debt investments but have a provision that allows the principal plus accrued interest to convert into an equity investment at a later date. This allows the original investment to get done more quickly with lower legal fees for the company at the time, but ultimately gives the investors the economic exposure of an equity investment. Interest: While the convertible note is in place, the invested funds earn a rate of interest like any other debt investment. The interest in not typically paid in cash, but accrued, which means the value owed to the investor builds up over time. Maturity Date: Convertible notes carry a maturity date, at which the notes are due and payable to the investors if they have not already converted to equity. Some convertible notes have an automatic conversion at maturity. Conversion Provisions: The primary purpose of a convertible note is that it will convert into equity at some point in the future. The most common method of conversion occurs when a subsequent equity investment exceeds a certain threshold. This is called a qualified financing. At this time, the original principal plus any accrued interest converts into shares of whatever new equity was just sold. In addition to getting the benefit of the accrued interest, which buys the convertible note holders more shares than they would have if they had waited and invested the same amount of money in the equity round of financing, they often get several additional perks in exchange for investing earlier. In the event that a qualified financing does not occur before the maturity date, some convertible notes also include a provision in which the notes automatically convert to equity, at a set valuation, on the maturity date. Conversion Discount: When the convertible notes convert to equity in the event of a qualified financing, not only do the note holders get credit for both their original principal plus accrued interest to determine how many shares they receive, they also generally get a discount to the price per share of the new equity. For example, if the discount is 20% and the new equity in the qualified financing is sold at $2.00 per share, the convertible note’s principal plus accrued interest converts at a share price of $1.60 per share. Valuation Cap: In addition to the conversion discount, convertible notes also typically have a valuation cap, which is a hard cap on the conversion price for noteholders regardless of the price per share on the next round of equity financing. Typically, any automatic conversions that occur at the maturity date (if no qualified financing has occurred) are at some price per share that is lower than the valuation cap. Yes No No while convertible debt is outstanding, then Yes after it converts to equity. No repayment until sale of company. Repayment on fixed schedule. Repayment on maturity, or converted to equity and no repayment until sale of company. Dividends accrued, and paid out upon sale of company. Interest paid on fixed schedule. Interest accrued, and either repaid on maturity or converted to equity. Paid after debt satisfied in full, and receives return of capital and accrued dividends (if preferred equity) plus share of remaining proceeds. Unlimited upside. Paid prior to equity, and receives remaining capital plus any unpaid interest. Upside limited to invested capital plus interest. If company is sold while convertible debt is outstanding, upside is typically capped at 1-2 times invested capital. If company is sold after it is converted to equity, it is paid after debt is satisfied but receives return of capital and accrued dividends plus share of remaining proceeds, and upside is unlimited. Now that we have discussed the typical terms and structure of a convertible note, we will now take a look at some of the reasons why companies use them as a way of raising investment funds, and some of the drawbacks as well. Convertible note financings are simpler to document from a legal perspective. This means that they are generally less expensive from a legal perspective and that the rounds can be closed more quickly. The reasons for this are pretty simple, being that the company and the investors are putting off some of the trickier details to a later date. In most equity financings, numerous corporate documents need to be updated to close the round such as certificates of incorporation, operating agreements, shareholder agreements, voting agreements, and various other items. All of this adds to the time and expense of completing a round of equity funding. Raising a convertible note as opposed to equity allows the company to delay placing a value on itself. This is particularly attractive to seed-stage companies that have not had time to show much traction in terms of their product and/or revenue. In exchange for giving investors a discount on the price that is set later, the company is able to push that decision to a later date. Because of this, convertible notes are often used as the first outside funding invested in many companies, and a large number of institutional seed investors such as 500 Startups exclusively use convertible notes in their accelerator investments. For a variety of reasons, many companies need to raise some amount of funding between larger rounds of equity, and the features of a convertible note make it an ideal vehicle to complete those types of transactions. For example, one company that I have worked with had a transformational software deal with a large enterprise customer that was set to close. The company would need to ramp up its staff in order to service the new customer, and was planning to raise a new round of equity once the deal was signed; however, they could not disclose the specifics of the deal until that time. In order to get a jump start on the work once the deal closed, the company wanted to raise a smaller amount of funds via a convertible note as it would allow the funding to close more quickly. It would also allow the company to delay the valuation decision for the equity round, as that would likely be more favorable once they were able to disclose the full details of the new contract. While there are many reasons why companies and/or investors choose to utilize convertible notes, both sides of the deal really need to think through the potential future implications of using this method of financing. The biggest issue that I have seen with seed stage companies is the question of what happens if the company cannot, or chooses not, to raise subsequent equity financing. While many convertible notes do include provisions for an automatic conversion on maturity, many do not. Given that we are mostly discussing very early stage companies, most of these companies are burning cash, and will not have the funds to repay the note at maturity if it does not convert. The best way to avoid this situation is for both the company and investors to have a clear plan for both success and failure. In most cases, if a company cannot raise additional funding past an initial convertible note seed investment, it is because the company does not have traction and will either end up going out of business or being acquired for a nominal amount. One interesting example from my work involves a company that received a seed investment in the form of a convertible note from a startup accelerator, and was not able to raise additional equity funding, but was able to gain enough traction to continue operations and get to cash flow breakeven. The company did not have nearly enough cash to repay the note, but it was not going out of business either. However, if the investor foreclosed on the company, it would have essentially put the company out of business and guaranteed that their investment would be worth nothing. This left both the company and the investor in an awkward position that took several years to get resolved. The awkward situation of the company described in the preceding anecdote can be avoided by negotiating the terms of an automatic conversion at the maturity of the note. However, if you go too far down the road of defining what that next round looks like in regards to all of the terms and provisions that would be included in a typical equity round you actually lose some of the benefits of using a convertible note in the first place. One example related to a company that I have worked with involving a promising software startup that was graduating from an accelerator program. It had a basic product, some name brand clients had already signed contracts, and the company had attracted potential investors. They chose to fund the round with a convertible note, but given that the note may have been enough funding to take the company past the maturity date, they wanted to know what their investment would be like if that happened. As it turned out, this led down the road to negotiating exactly what the specific terms of that equity round would look like, and the company ended up spending as much on legal fees as if they had just done the equity round to begin with. The majority of convertible notes issued in seed funding scenarios at this point in time include a valuation cap and an automatic conversion price. While you are technically delaying putting a price on the company, oftentimes the cap and conversion price effectively acts to anchor the price negotiations of the next round. Even if investors are willing to pay for a big uptick in valuation from the note valuation cap, you can end up with some very strange situations. For example, if the subsequent round of equity is preferred stock with a liquidation preference equal to the price per share of that round, convertible note holders can end up with a liquidation preference of several times their investment if there is a large uptick in valuation. In situations like this, the new investors may try to force the note holders to adversely amend their terms in order to close the deal. EXAMPLE: A startup company with 1,000,000 shares of common stock closes a seed funding round of $1,000,000 in the form of a convertible note, with a valuation cap of $5,000,000 pre-money valuation on the next round of financing. For simplicity, assume the note carries a 0% interest rate. The company makes a lot of progress and has a venture capital firm willing to do a $4,000,000 Series A financing at a pre-money valuation of $20,000,000, with a liquidation preference of 1x. The $4,000,000 series A investment will buy 200,000 shares of preferred stock at $20/each, with each share carrying a liquidation preference of $20, plus any accrued dividends. Because of the valuation cap, the $1,000,000 convertible note will convert to the same type of equity at the rate of $5/share, but those shares will have a liquidation preference of $20/each plus dividends which means they would effectively have a 4x liquidation preference! It is highly unlikely the series A investors would allow this to happen, and would likely require the convertible note holders to renegotiate. When it comes to using convertible notes as a seed investment, the best advice I can give is to understand all the implications of the various potential outcomes. Make sure you know what happens if you do not end up raising additional equity, and also what happens if things go spectacularly well and you are able to raise additional equity far above the valuation cap (if that is part of the note). The examples above are helpful places to start in regards to looking at documents that have been used successfully many times over, but I would caution that every situation is unique. I would definitely not recommend closing a round of investment without a lawyer that is knowledgeable in fundraising for startups, and I often recommend that startups work with a fundraising expert who can help them understand how to approach their fundraising necessities in the most efficient and fruitful way.